Traditional Mexican appetizer. queso asadero topped w/ chorizo. prepared at your table. choice​ of beef or chicken. served w/ guacamole & cream. choice of ground beef, shredded chicken, or bean. flautitas, beef/chicken quesadilla, guacamole & chile con queso. beef & vegetable soup, served w/ rice. chicken & vegetable soup, served w/ rice. prepared w/ lettuce, tomatoes & topped w/ cheese. guacamole & sour cream in a tortilla shell. mexican salad w/ choice of beef or chicken fajita. cheese taco, chicken enchilada, beef enchilada. served w/ rice & refried beans. whole tilapia fried. served w/ rice & spicy corn salad. contains bones. shrimp cocktail prepared w/ our spicy cocktail sauce. monterrey style, onions, cilantro & avocado. shrimp sautéed in garlic butter, tomatoes, onions, green peppers, olives, cilantro. served on a bed of rice & baked potato. jumbo shrimp cooked in a spicy tomato sauce. served w/ spaghetti & mushrooms. marinated shrimp in a special sauce, cooked on the grill. served on a bed of rice w/ a baked potato. catfish fillet, sautéed w/ butter, garlic, wine, topped w/ mild cilantro sauce. served w/ rice. whole catfish (headless) breaded & fried. served w/ fries & salad. catfish filet breaded & fried. served w/ fries & salad. three cheese enchiladas smothered w/ ranchera salsa & shrimp. served w/ rice & avocado slice. served w/ charro beans, rich, guacamole & pico de gallo. Grilled baby goat, a delicacy of northern Mexico, served family style w/ rice, charro beans, guacamole, & pico de gallo. baby goat topped w/ salsa de tomate. served w/ charro beans, rice & pico de gallo. beef​ tenderloin or chicken stew in roasted tomato salsa & topped w/ cheese. served w/ refried beans. beef​ stew w/ diced green peppers, onion, tomatoes, jalapeños, spicy. served w/ rice & refried beans. pork in salsa de chile ancho. served w/ rice & refried beans. first in dallas to introduce “sweet breads.” served w/ onions & charro beans. fried tripe. served w/ rice & charro beans. pork loin, marinated in chile ancho. cooked & served w/ rice & refried beans. beef​ or chicken pounded thin, breaded & fried. served w/ salad & fries. Serves two. 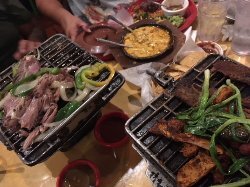 grilled tender chunks of fajitas, chicken, beef, sausage & ribs, all served on a Mexican parrilla, charro beans & rice. choice​ of chicken or beef. served w/ guaca mole, pico de gallo, & charro beans. charcoal broiled flat steak. served w/ rice, refried beans, pico de gallo & guacamole. 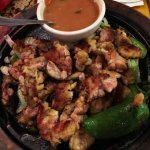 three fajita tacos. 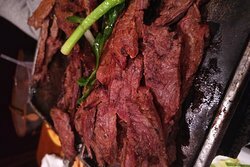 beef or chicken. served w/ rice, charro beans, pico de gallo & guacamole. grilled rib eye steak smothered w/ salsa de chili chipotle. served w/ rice & refried beans. t-bone served w/ rice & refried beans. four beef short ribs w/ guacamole, pico de gallo, rice & refried beans. 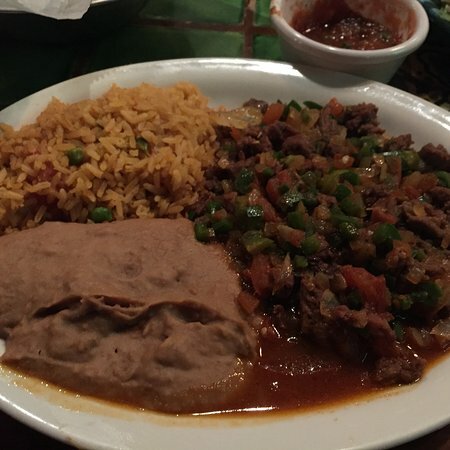 three steak medallions, three jumbo shrimp, zucchini, mushrooms, bell peppers, rice & charro beans. chunks of top sirloin on skewer w/ bell pepper, tomato & onions. served w/ rice & charro beans, guacamole & pico de gallo. liver cooked w/ onions & spices. served w/ rice & refried beans. chicken enchiladas w/ tomatillo sauce topped w/ crema mexicana, lettuce & tomato. 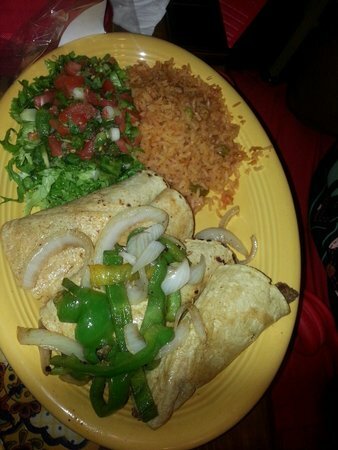 one large poblano pepper stuffed w/ cheese or shredded beef. served w/ rice, refried beans & guacamole. two pieces of chicken topped w/ mole. served w/ rice & refried beans. two fried rolled corn tortillas w/ chicken topped w/ guacamole sauce, rice & refried beans. monterrey style hamburger, guacamole, refried beans, cheese, ham & jalapenos. served w/ fries. lettuce, tomato served w/ fries. 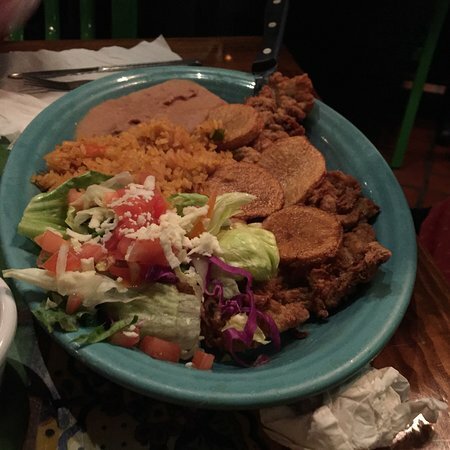 choice​ of beef, chicken, or milanesa. choice​ of one enchilada, or one taco or one chalupa. served w/ rice & refried beans. chicken fingers served w/ fries. Food is not good,I only go there for the mariachis. They really need to put attention in the kitchen. I normally love this place, but today all the guests are wearing winter coats. I asked and they have no heat. Are you kidding? This is evidently the usual since the staff don't seem to mind. 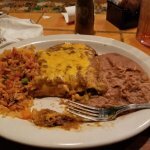 Great food and truly authentic Tex-Mex. We discovered this place a couple of years ago and just keep coming back. So many great items on the menu and perfect for large groups. The service is always wonderful. Delicious! What food I had was good. They had some great salsa. 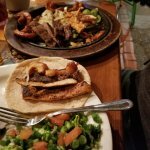 I would not classify this as the best Latin food that I have eaten but it was good and that is why I gave it an average. Our family met here for dinner. We had reservations and were seated right away. Some of our party were late but we weren’t rushed and had drinks and starters. 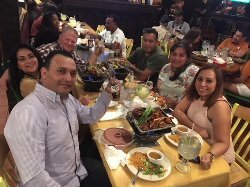 The food was enjoyed by most everyone. The waiter was very nice and helpful. 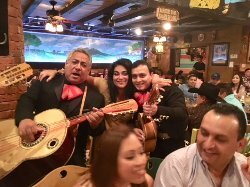 Great Food with Live Mariachi Music! Do they have tamales and do they have flan? Thank you! No tamales but yes to flan!